From three-stone stunners to angel-worthy halos, these Christopher Designs engagement rings are sure to bring the sparkle! Plus, with the signature L'Amour Crisscut patented technology, your center diamond could size up to 50% larger than a traditional cut. Featuring an 18k white gold and round diamond setting, this pear-shaped halo ring is perfect for the bride who wants a classic design with a bit of an edge. Rock this ring like a rockstar! It features a fancy yellow diamond center and a two-tone, twisted shank in 18k gold and mixed metal. This untraditional design features a pear diamond center and hugs your finger with a decorative row of round cut diamonds and an 18k yellow gold and mixed metal band. Sparkle aplenty with this pear-shaped diamond set in a halo of round diamonds. The design features a subtle, pavé split shank with diamonds going halfway around the 18K white gold band. The pear shape center diamond is accented with round cut diamonds set in 14K white gold, and the unique split shank affords an elegant look. The classic three-stone enagement ring showcases an oval diamond center, and the two Crisscut round diamond sides make for triple the beauty. 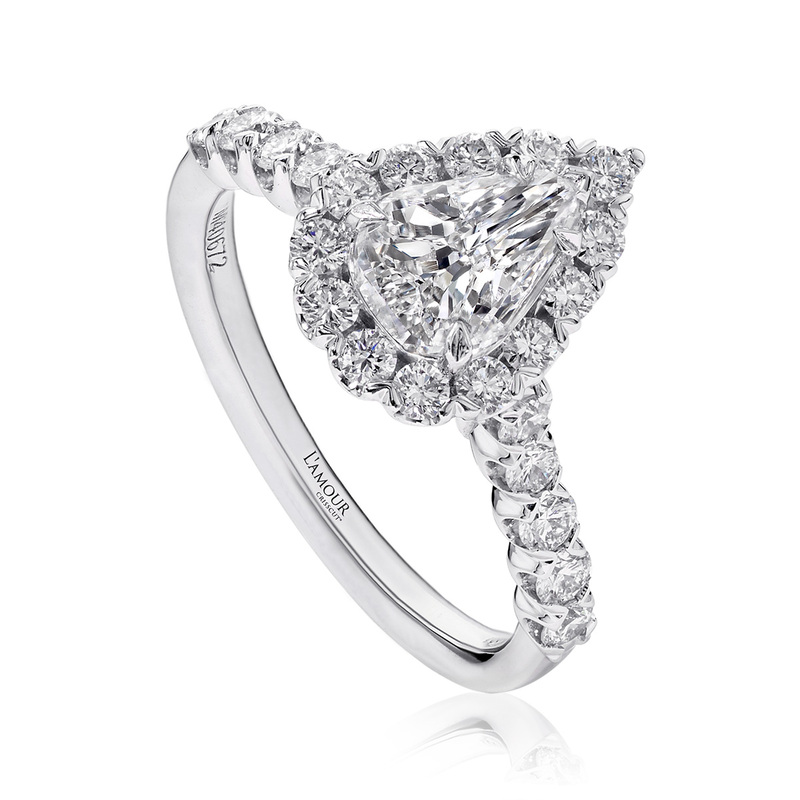 Add a halo and round cut diamonds falling halfway around the band in 18K white gold, and this ring is a must-see. An oval diamond center surrounded by round diamonds glistens with a halo design, and pavé set split shank with diamonds going halfway around the band in 18K white gold. A traditional oval engagement ring gets some extra oomph with a round diamond halo, and shared-prong round diamonds halfway down the shank in 18k white gold. This swoon-worthy engagement ring features a solitaire oval diamond center and pavé set round diamonds falling halfway around the platinum band. Why have one Crisscut diamond when you can have three? Plus, the oval center and round side stones are each wrapped in a halo, and diamonds fall halfway around the band in white gold. Triple the compliments for this three-stone engagement ring! The Crisscut center and side diamonds are surrounded by round diamond halos, and the design also features a pavé set split shank, plus diamonds halfway around the band in 18K white gold. Dress up that finger with a Crisscut Original center diamond embellished by two fancy cut sides. All three stones are surrounded by round diamond halos, and for some extra sparkle, pavé set diamonds run halfway down the band in Platinum. It's a traditional choice that's simply timeless! The center stone is embellished by a halo of round diamonds, and pavé set diamonds go halfway around the band in 18K white gold. This L’Amour Crisscut® Original diamond engagement ring is sure to make a statement with its halo design and tapered baguette side stones, surrounded by round diamonds and set in 18k white gold. The L’Amour Crisscut® diamond center is surrounded by a round diamond halo, and features shared prong-set diamonds halfway around the band in 18K white gold. Change things up with this impressive L’Amour Crisscut® Cushion shape diamond halo, featuring a two-tone twisted shank accented by round diamonds. For the bold bride, this L’Amour Crisscut® Cushion diamond halo engagement ring is embellished by two fancy cut side stones and a double shank with diamonds halfway down the band in 18K white gold. This L'Amour Crisscut cushion shape diamond dazzles beyond measure with its halo and three rows of round cut diamonds set in a spilt shank of 18K white gold. Undeniably timeless, this L’Amour Crisscut® Cushion diamond halo design is elevated by a row of shared-prong round diamonds going halfway around the band in 18K white gold. If you're seeking a classic stunner, you might want to drop hints to your partner about this L’Amour Crisscut® Cushion diamond ring design. The center stone is surrounded by a halo of round diamonds, and the delicate split shank is lined with round diamonds set in 18K white gold.